Becker’s starting level 5 with 9,250 after a bit of a rollercoaster during the last level. 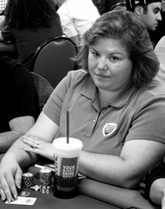 She started with 15,400 but took some serious hits after, as she puts it, misplaying A-K and A-J. Those misteps brought her stack down to 4,500 but she bullied back at her table with the shortstack, pushing all-in preflop with A-Q, K-Q suited and pocket threes to get her up to 9,250. The 5th level is now underway and blinds are now at 150-300, with antes at 25. As we’re typing this we just got word that Becker is up over 18k so it looks like she’s doubled up again. While Becker is still making a run during Day 1D, a lot of top pros have bailed out early including Alan Boston, Max Pescatori, Amnon Filippi, Erik Seidel, Raymond Bitar, Erik Lindgren and Chip Reese. Lennox Lewis, who could kick our asses so we won’t say anything rude about him, is also out, as is Dean Cain, who once played Superman and will forever be known only as the guy who once played Superman even though strangely nobody ever watched Dean Cain as Superman when he was Superman. Crap he was Superman so long ago that Teri Hatcher was actually hot when Dean Cain was Superman. Anyway, Dean Cain is really actually a nice guy, had a birthday today and has been eliminated.